THE University of Guyana (UG) in partnership with the University of the West Indies (UWI) will roll out Master’s and Associate Degrees in Petroleum Engineering next January, Vice-Chancellor, Professor Ivelaw Griffith said. The vice-chancellor made the disclosure at the Education Lecture Theatre, UG, on Wednesday during a meeting on proposed higher education consortium on engineering and mining. He said some of the courses will be delivered in Guyana and some in Trinidad. “We are going to be rolling out in partnership with the West Indies a Master’s in Petroleum Engineering from next January… I am in talks with Caribbean Airlines to talk about fare discounts so that the students who have to travel can benefit from discounted fares and the lecturers’ who have to go back and forth can benefit,” he said. He said many companies related many positive things about the benefits of hiring graduates and they have signalled their intentions to set up shop in Guyana. The vice-chancellor said in preparing for first-oil and beyond, UG started preparations in September of last year with a listening session of industry stakeholders to understand what their perspectives are and desired interests. “We may not be able to meet all those interests, but it is better to have a baseline, but we also know that with the industry listing, we had focused primarily on technical and engineering, we know that the pursuit of oil and gas goes beyond engineering and technical,” he said. He explained that all aspects of the university’s programmes were inspected and all suitable areas in capabilities and gap analysis were identified and collaboration with institutions outside of Guyana commenced. A UG team had visited the University of Trinidad and Tobago and the University of the West Indies and an agreement was struck to develop various courses. “Continuing the journey, we have worked towards renaming the Faculty of Technology to the Faculty of Engineering and Technology. We have brought on board two technical advisers for the vice-chancellor, one from UWI and one from the University of Trinidad and Tobago, who has been helping us get the ground- work and preparation done,” he explained. He also noted that a variety of curriculums are being provided. “The partnerships we are looking for go beyond engineering and technology, but even if you were to limit the partnership potential possibilities, we are more than just about petroleum engineering and mining, so we have been saying to them, we want to make investments in mechanical, we want to make investments in civil, we want to make investments in electrical, we want to make investments in natural sciences, in math’s, psychics and those are critical basis to enhance what we will do,” said Professor Griffith. At the end of the meeting, the vice-chancellor noted that it is hoped all the participants will agree on a process and time frame for adopting and signing of an agreement on priority activities. Meanwhile, Director of the Department of Energy, Ministry of the Presidency, Dr. Mark Bynoe, said Guyana has a five-point vision in moving the oil-and-gas sector ahead. He said it is important for Guyana not to be locked into oil and gas and lose the bigger picture. “Oil and gas will just be the precursor to take us where we ought to be… it’s imperative that we look at capacity-building outside of just the oil sector…. What information are we using in decision-making; how can we be certain that the data we are getting is accurate; where are our economic models? 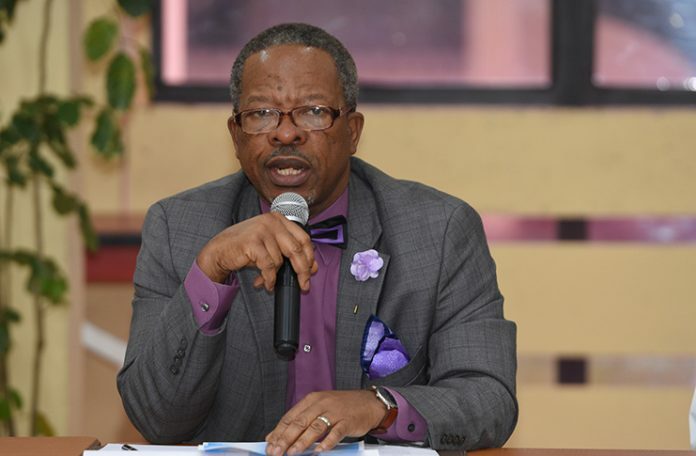 So it’s imperative we look beyond oil and gas,” Dr. Bynoe said. Participants at the event included representatives from the Essequibo Technical Institute, the Government Technical Institute, GPL Training School, the Guyana Industrial Training Centre, Leonora Technical Institute, Linden Technical Institute, Ministry of Education and the TVET Council, among others.